An extended range of engines, new edition models and numerous other attractive additions to the program of standard and special equipment items diversify the BMW model program for spring 2012. 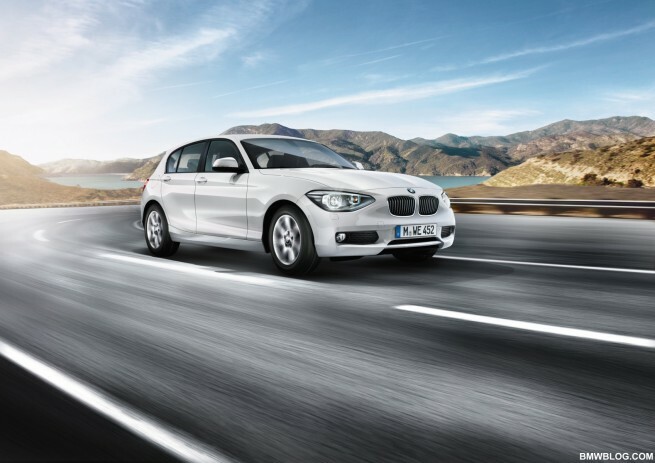 The BMW 1 Series and BMW 3 Series feature newly developed petrol and diesel engines for further increased driving pleasure while at the same time reducing fuel consumption and exhaust emission levels to a greater degree. The BMW 1 Series Coupé and the BMW 1 Series Convertible are offered in the Exclusive and Sport editions. The M Sports package is available for the new BMW 1 Series five-door model. Additional diesel models can be ordered with BMW BluePerformance Technology. Vehicles fitted with this technology already meet all the requirements of the EU6 emission standard. The intelligent all-wheel drive system BMW xDrive now ensures superior traction in the sporty 6-cylinder diesel models BMW 640d Coupé and BMW 640d Convertible. And in the BMW Z4 Roadster the driver can now open and close the hard top while driving, too. New edition models for the BMW 1 Series Coupé and BMW 1 Series Convertible, as well as new engines and an M Sports package for the new BMW 1 Series five-door model. Agile handling properties, exclusive fittings and a powerful, distinctive design have made the BMW 1 Series the epitome of driving pleasure in the premium compact segment. These qualities are now spotlighted even more with new special editions of the sporty, elegant two-door BMW 1 Series Coupé and BMW 1 Series Convertible. The high-quality options have been carefully harmonised, with appealing touches added to both body design and the interior. In addition to exclusive exterior paint finishes and light alloy wheels, there are also special upholstery covers with matching interior strips which give the edition models a flair that is both exclusive and individual. The BMW M Sports package for the new BMW 1 Series further enhances the dynamic driving properties of this compact five-door model as well as translating them into a striking look. Edition Exclusive for BMW 1 Series Coupé and BMW 1 Series Convertible. The Edition Exclusive is an especially stylish version of the BMW 1 Series Coupé and the BMW 1 Series Convertible. Here the vehicle’s appearance is enhanced by means of window cavity covers and side frame strips in Chrome Line or the optional BMW Individual high-gloss Shadow Line. Another eye-catching feature is the range of light alloy wheels available in 16, 17 and 18-inch format (depending on engine type). The customer can opt for the exclusive body finish in Mineral Grey metallic or else one of five finishes drawn from the standard portfolio. A further dash of colour is provided by the exterior mirrors in Oxide Silver matt finish. Exhaust covers and longitudinal kidney grille bars in chrome (for all engine types) complete the package of body features. Boston leather trim characterises the interior of the Edition Exclusive. The seats are finished either in Pearl Grey with grey contrast stitching or in black with white contrast stitching. The refined ambience is supplemented with door sill cover strips featuring BMW Edition lettering, interior strips in aluminium accentuation polish or in the optional fine wood finish Fineline Anthracite, an anthracite-coloured BMW Individual roof liner for the 1 Series Coupé and floor mats with welt in matching colour. The Edition Exclusive is rounded off with a new sports steering wheel featuring attractive chrome trim including multifunction and a handbrake handle with decor trim element in chrome. BMW 1 Series Coupé and BMW 1 Series Convertible in the Edition Sport. 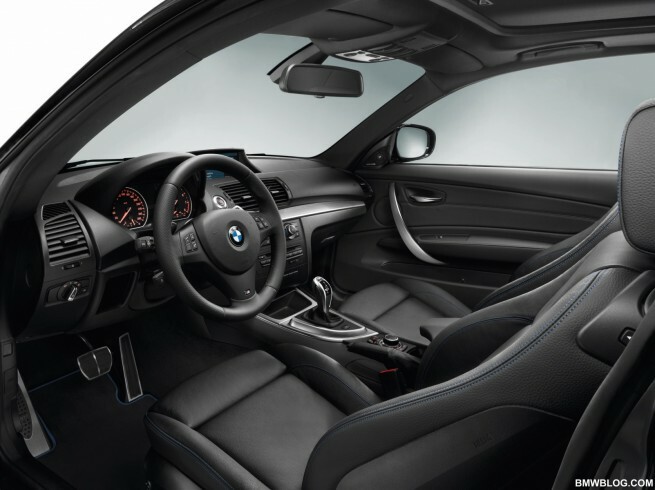 The Edition Sport further boosts the athletic potential of the BMW 1 Series Coupé and the BMW 1 Series Convertible. In addition to the M Sports chassis, the equipment features for both interior and exterior help further intensify the dynamic driving experience. The athletic ambitions of vehicles featuring the M aerodynamic package are also given visual emphasis with the exclusive paint finish Carbon Black metallic as well as 17 and 18-inch M light alloy wheels in double spoke design. The exclusive appearance is also supported by window cavity covers in BMW Individual high-gloss Shadow Line (or alternatively Chrome Line Exterior) and exterior mirrors finished in black. A dash of sporty flair is also added by the longitudinal kidney grille bars in high-gloss black, rear lights in Blackline Design and chrome exhaust covers. On the inside, sports seats, the M leather steering wheel (including multifunction), stainless steel pedals and the M footrest in aluminium reflect the exclusivity of the edition model. The M gearshift lever and handbrake handle including gaiter are finished in embossed soft nappa leather. The equipment features of the Edition Sport are rounded off with seat covers and door trim in the fabric/Sensatec combination Flashpoint Black (alternative: optional Boston leather trim in black) with contrast stitching in blue, interior strips in aluminium glacier silver and matching floor mats with blue welt. Extended range of engines for the new BMW 1 Series five-door model: new 4-cylinder petrol engine in the BMW 125i and two state-of-the-art turbodiesels in the BMW 125d and BMW 116d EfficientDynamics Edition. The three state-of-the-art 4-cylinder engines available for the compact five-door model from spring 2012 promise top-class performance figures and exemplary levels of fuel consumption. All power units are fitted with the unique BMW TwinPower Turbo Technology, with additional measures derived from the BMW EfficientDynamics development strategy ensuring a further reduction in fuel consumption and emissions. The new 2.0-litre engines in the BMW 125i and BMW 125d are considerably more powerful than their respective predecessors, even though they are superior in terms of fuel consumptions and CO2 emissions. 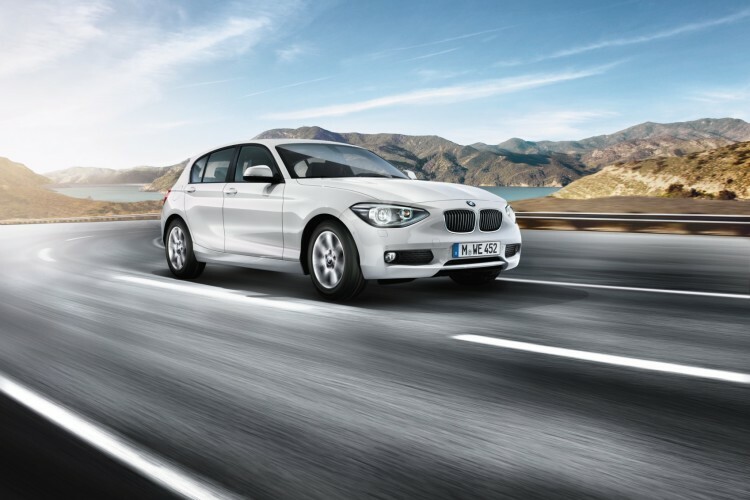 BMW 125i: athletic power delivery and supreme efficiency. As a representative of the latest generation of 4-cylinder petrol engines, the new 2.0-litre power unit makes use of the globally unique BMW TwinPower Turbo Technology which includes supercharging based on the TwinScroll principle, High Precision Injection, the variable valve control system VALVETRONIC and the variable camshaft control system double VANOS. Thanks to this combination, the engine delivers a peak output of 160 kW/218 bhp at 5,000 rpm, quickly developing a maximum torque of 310 Newton metres which is available across a broad range of between 1,350 and 4,800 rpm. Performance figures are highly athletic as a result: from standing, the BMW 125i passes the 100 km/h mark after 6.4 seconds with the 6-speed manual transmission (8-speed automatic transmission: 6.5 seconds), reaching a top speed of 245 km/h (243 km/h). The fuel consumption and exhaust emission figures are no less impressive. With an average fuel consumption of 6.6 litres per 100 kilometres (6.4 l/100 km) and CO2 emissions of 154 grams per kilometre (149 g/km), the powerful BMW 125i gives an impressive performance in terms of economy, too. 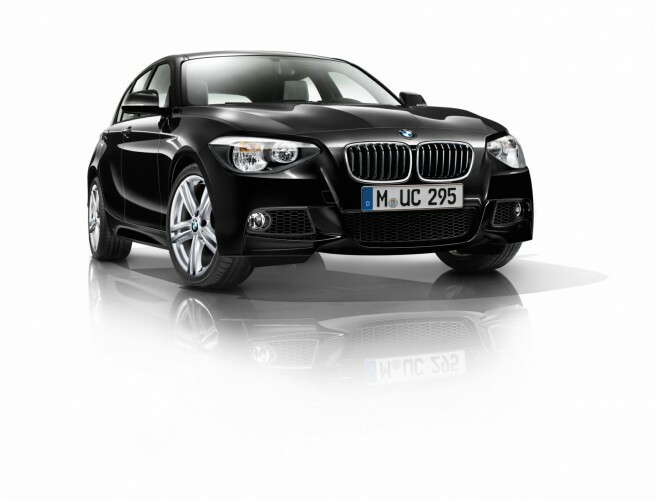 BMW 125d: pulling power and economy at the very highest level. With a top output of 160 kW/218 bhp at 4,400 rpm, surpassing its predecessor model BMW 123d by 10 kW, and a powerful maximum torque of 450 Newton metres, (+ 50 Nm) available between 1,500 and 2,500 rpm, the new BMW 125d is more spirited than ever before. This is not least due to the latest generation of common rail direct injection as well as the turbocharger with variable inlet geometry. Both with 6-speed manual transmission and with 8-speed automatic transmission, this compact five-door model spurts from zero to 100 km/h in just 6.5 seconds if necessary, reaching a top speed of 240 km/h. And yet this solid diesel with manual transmission still achieves an average fuel consumption level of just 4.9 litres per 100 kilometres, with CO2 emissions at 129 grams per kilometre. The automatic version is even more economical: here the BMW 125d has an average fuel consumption of just 4.8 litres per 100 kilometres with CO2 emissions at a level of 126 g/km. BMW 116d EfficientDynamics Edition: the CO2 champion at 99 g/km. The new BMW 116d EfficientDynamics Edition sets impressive new standards, further extending the leadership of BMW diesel technology in terms of efficiency. It is powered by a 1.6-litre 4-cylinder diesel engine and features additional measures to reduce fuel consumption and emissions, with further optimised factors as engine efficiency, aerodynamic properties and rolling resistance. In this way it is able to deliver a maximum output of 85 kW/116 bhp at 4,000 rpm, developing a torque of 260 Nm between 1,750 and 2,500 rpm. The new BMW 116d EfficientDynamics Edition is fitted with a 6-speed manual transmission and accelerates in 10.5 seconds from zero to 100 km/h, with a top speed of 195 km/h. Its average fuel consumption is unbeatably economical at 3.8 litres per 100 kilometres, with CO2 emissions of only 99 grams per kilometre. With its new engines, the BMW 1 Series five-door model once again takes the lead in its segment, extending its lead as the sportiest and also most efficient vehicle in its class. Finally, BMW BluePerformance Technology is now optionally available for the BMW 120d, allowing the emission levels of the well-established diesel engine to be optimised even further. As well as the diesel particulate filter and oxidation catalytic converter, an additional NOX catalyst storage makes for a further reduction of the nitrogen oxides contained in exhaust gas, which means that the BMW 120d BluePerformance already meets the requirements of the EU6 emission standard due to take effect from 2014. M Sports package for the new BMW 1 Series five-door model: enhancing chassis and aerodynamics as well as body and interior design. Thanks to its classic rear-wheel drive, state-of-the-art 4-cylinder engines and hallmark brand proportions, the new version of the compact five-door model is truly impressive with its sporty driving dynamics, unique handling qualities and innovative elegance. From spring 2012, the M Sports package is now also available for the new BMW 1 Series, providing an especially intense driving experience. High-quality components such as the M Sports suspension lowered by 10 millimetres with tighter spring/shock absorber settings and harder anti-roll bars tangibly emphasise the active driving character of this BMW, with an extended wheelbase as compared to the predecessor model and a wider track width providing the perfect basis. An M Sports brake is optionally available as an exclusive feature with the M Sports package, except for the models BMW 125i and 125d. It consists of aluminium multi-piston fixed calipers finished in dark blue metallic bearing the BMW M logo and 17-inch lightweight construction brake discs. This further enhances the driving dynamics potential of the compact five-door model. Another such feature is the 17 or 18-inch M light alloy wheels in double spoke styling with mixed tyres. In addition to the M aerodynamic package with numerous body components for the front, side and rear sections and the BMW Individual high-gloss Shadow Line, the exterior paint finish in Estoril Blue 2 metallic optionally available exclusively with the M Sports package ensures an unmistakably sporty look. Inside the vehicle, components such as aluminium door sill cover strips with M emblem, M leather steering wheel with multifunction buttons, M footrest and M gearshift lever help go together to create a sporty, elegant feel. The driver and front passenger sit on sports seats available exclusively for the M Sports package in Hexagon Anthracite fabric/Alcantara with contrast stitching in Royal Blue. Furthermore, the driver has the use of a sports-style instrument panel with red accentuations and chrono scaling. The M Sports package is rounded off with interior strips in the equally exclusive Aluminium Hexagon finish with accentuation strip either in Estoril Blue matt or high-gloss Black and an anthracite-coloured BMW Individual roof liner. BMW Z4: retractable hard top can now be opened and closed at speeds of up to 40 km/h. It is well known that the BMW Z4 can be swiftly transformed from coupé to and open-top roadster, since opening the dual-section hard top is fully automatic and takes just 22 seconds. And closing the roof is even faster, taking just 19 seconds. As of spring 2012, the comfort and functionality of the roof kinematics are improved a stage further. A reinforced hydraulic system means that the driver can now open or close the hard top while travelling at speeds of up to 40 km/h, enabling an even more flexible response to the vagaries of the weather. Extended engine range for the new BMW 3 Series Sedan: new 4-cylinder petrol engine in the BMW 320i and two revised turbodiesels in the BMW 318d and 316d. BMW is expanding its range of engines for the new BMW 3 Series Sedan with the addition of three power units which are all characterised by a high level of output and outstanding efficiency. BMW 320i with BMW TwinPower Turbo Technology. After the BMW 328i, the second representative of a new generation of 2.0-litre 4-cylinder petrol engines sees its debut in the new BMW 320i. In the new model, the TwinPower Turbo delivers an output of 135 kW/184 bhp at 5,000 rpm, reaching a maximum torque of 270 Nm from just 1,250 rpm. This puts it 10 kW above the maximum output of its predecessor, while in terms of pulling power it even achieves an increase of 60 Nm. On this basis, the new BMW 320i with 6-speed manual transmission accelerates in just 7.3 seconds from zero to 100 km/h, 0.9 seconds faster than its predecessor model. In spite of these increased driving performance figures, the sedan is considerably more economical in terms of fuel consumption. With an average rate of just 5.9 litres per 100 kilometres on the EU test cycle, the BMW 320i undercuts the fuel consumption level of its predecessor by 0.5 l/100 km, in other words around seven per cent. The technological advance is even more striking in conjunction with the 8-speed automatic transmission: here the reduction as compared to the predecessor model with 6-speed automatic transmission is as much as 12 per cent. The new 4-cylinder spark ignition engines are key elements of the BMW EfficientDynamics development strategy, geared towards increasing driving pleasure while cutting back fuel consumption and exhaust emissions. The engine of the BMW 320i is based on a friction-optimised basic 1,997 cc engine whose output differentiation is primarily derived from injection and turbocharging technology. The main components of the globally unique BMW TwinPower Turbo Technology include High Precision Injection, supercharging based on the TwinScroll principle, the variable valve control system VALVETRONIC and the variable camshaft control system double VANOS. Thus equipped and fitted with an all-aluminium crankcase, these engines move into an output range which would otherwise only be achieved by conventional naturally aspirated engines with a higher number of cylinders and larger capacity. 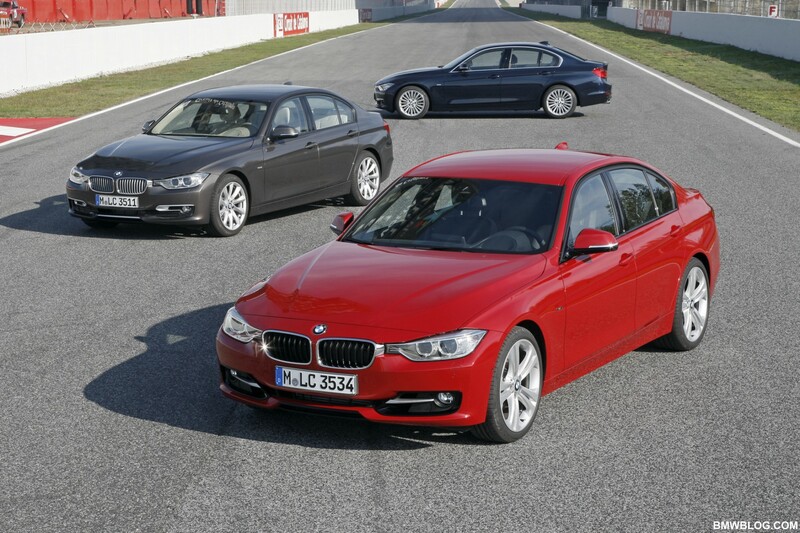 BMW 318d and 316d: high-torque, smooth-running and efficient. The diesel power units in the new 3 Series Sedan also draw on state-of-the-art BMW TwinPower Turbo Technology. Latest generation common rail direct injection, turbocharging and all-aluminium construction ensure a high level of pulling power, running smoothness and unsurpassed efficiency in these modern 4-cylinder engines. A centrifugal pendulum in the dual-mass flywheel compensates for irregular revolutions and supports comfortable driving within low engine speed ranges. All diesel engines can be combined with the new 8-speed automatic transmission if required. The two turbodiesels are familiar from the predecessor model and offer the respective driving performance figures. In the new BMW 318d, the output of the diesel engine is 105 kW/143 bhp at 4,000 rpm, with a maximum torque of 320 Nm is available between 1,750 and 2,500 rpm. Considering its acceleration rate of zero to 100 km/h in 9.1 seconds (automatic transmission: 9.3 seconds) and a top speed of 210 km/h, the new BMW 318d is highly fuel-efficient, with an average consumption of 4.5 litres per 100 kilometres in both transmission versions. The level of CO2 emissions is 117 grams per kilometre. In spite of enhanced driving performance figures, this means a saving of two and 24 per cent respectively as compared to the predecessor model. The entry-level diesel engine of the BMW 316d is particularly geared towards economy. At an engine speed of 4,000 rpm it delivers a peak output of 85 kW/116 bhp, developing a maximum torque of 260 Nm between 1,750 and 2,500 rpm. This enables the sedan to accelerate from zero to 100 km/h in 10.9 seconds (automatic transmission: 11.3 sec), achieving a top speed of 202 km/h. The average fuel consumption is 4.4 litres per 100 kilometres (automatic transmission: 4.5 l/100 km), with CO2 emissions at a level of 115 and 116 grams per kilometre respectively. The progressive BMW BluePerformance Technology is available as an option for the BMW 320d EfficientDynamics Edition as of spring 2012, combining the diesel particulate filter and oxidation catalytic converter with an NOx catalyst storage. The system brings about a significant reduction in nitrogen oxides, remaining comfortably within the threshold stipulated by the EU6 emission standard. BMW 5 Series: EU6 emission standard for Sedan and Touring with diesel engine and more favourable type classification for a range of models. In order to optimise exhaust gas quality, the diesel models BMW 520d and BMW 520d EfficientDynamics Edition can also be ordered with BMW BluePerformance Technology from spring 2012. The additional NOx catalyst storage significantly reduces nitrogen oxides, so the vehicles in question already meet all the requirements of the EU6 emission standard which will apply from 2014. 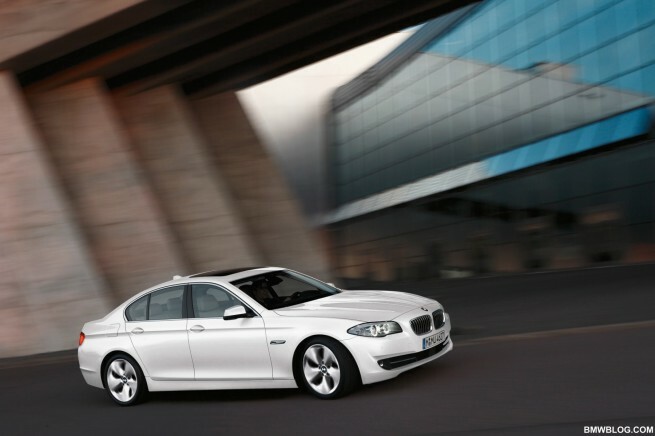 What is more, the 5 Series Sedan benefits from a new type classification for fully comprehensive insurance. Since October 1st 2011 the BMW 523i, BMW 535i, BMW 520d and BMW 530d have been moved down to a more favourable class, which has a positive impact in terms of insurance premiums. There are no changes for the BMW 528i and BMW 550i. 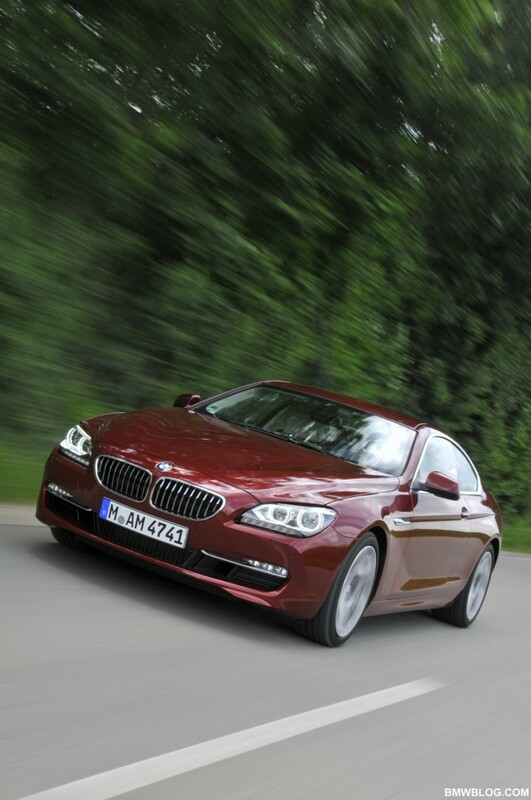 BMW 6 Series: premiere for BMW xDrive in the sports diesel models BMW 640d Coupé and BMW 640d Convertible. After its debut in the BMW 650i, the intelligent all-wheel drive system BMW xDrive now also ensures supreme control and maximum acceleration in the sporty 6-cylinder diesel models BMW 640d Coupé and BMW 640d Convertible. In addition to the characteristic benefits of all-wheel drive, xDrive with its electronic control system and extremely fast power distribution between front and wheels also guarantees superior traction, maximum safety, excellent handling and optimum application of engine power in all weather and road conditions. This means that the potential of the 230 kW/313 bhp in-line 6-cylinder engine with BMW TwinPower Turbo Technology can be put to even more effective use, especially since the torque maximum of 630 Nm is already available within the range of 1,500 to 2,500 rpm. BMW xDrive constantly operates on an anticipatory basis, stabilising the vehicle when required even before the driver notices that there is a need for action. An optimised set-up, promoting agility and precision on bends too, provides an ideal combination of dynamic performance and comfort – an excellent basis within the premium segment of exclusive 2+2-seaters for providing driving pleasure which is both dynamic and efficient.